Resist shock, fire, frost, magic, disease, and poison by 10%. Empowers Keening and Sunder when equipped. 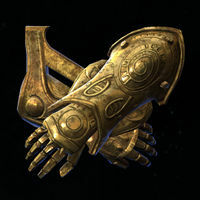 Wraithguard is an artifact created by Kagrenac. It is heavy armor[verification needed] and enchanted with the following: Resist shock, fire, frost, magic, disease, and poison by 10%. Empowers Keening and Sunder when equipped. It can be improved with an (?) ingot. It counts as (?) armor for the purpose of the Matching Set perk. It can be obtained by completing the quest Legends Lost. This page was last modified on 14 March 2019, at 04:16.